We have all been there. Deleted an email we thought was unimportant, and now we need it back. Or you were sure it was in a certain folder, but now it cannot be found. Or maybe you get a message "Cannot open the Outlook window", or similar, and your email will not open at all. The first question: is your email stored on an Exchange server, or an IMAP server, or in GMail, or it is all downloaded to your PC? Most email today is stored on a server, which makes it easier to recover. Outlook works best with Microsoft Exchange or Office 365 (hosted Exchange). This can be confusing for users though since the exact features of Outlook vary depending on what kind of account you have. So what kind of account do you have? Probably you know already. If not, the sure-fire way to discover is to open the Mail applet in Control Panel. Click Start, type Control Panel, and when it opens, type mail in the search box at top right and open the Mail applet. Take note - this little applet is a key tool in troubleshooting and fixing Outlook issues! For now though, click Email Accounts. Note what type of account or accounts you have. Both Office 365 and on-premises Exchange show as "Microsoft Exchange". Other common accounts are POP3 or IMAP. The good news is, it is fairly hard to delete emails completely (quickly) from Exchange or Office 365. When you delete an email it goes into a folder called Deleted items. If the email is deleted from there, it is still not deleted immediately. 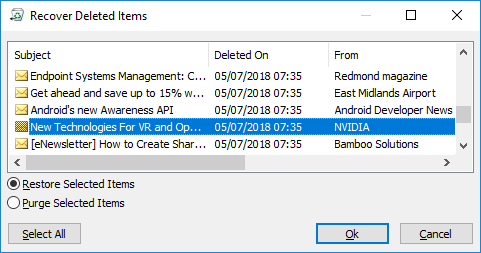 Select the folder, and then on the Folder menu in the ribbon click Recover Deleted Items. Find your email (click on a column header to sort by that column), select the lost email, and click OK to recover it. When you do a search on the Inbox, all subfolders are searched as well. You are searching your entire mailbox. Be patient as this can take a while. Outlook won't open at all? You have a couple of options. 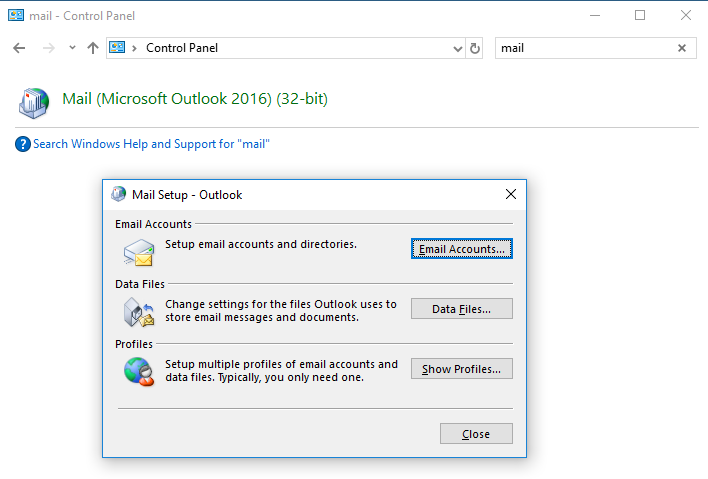 You can reset your Outlook so that your mailbox is downloaded again. To do this, head fo the Mail applet described above. In the Accounts dialog select your Exchange account and click Remove. Then click New and set up a new account. Some kinds of corruption are best fixed by creating a new Outlook profile. This also means you can go back to the old one if necessary. Manage profiles in the Mail applet using the Profiles dialog. If you create a new profile and log onto it with Outlook, it will prompt you to set up an email account and you can enter your Exchange or Office 365 details and re-download your email. You can also have a look at Outlook Web Access. In Office 365 and almost all Exchange setups, you can get your email from a web browser. For Office 365, go to https://portal.office.com and log on. For Exchange, get the URL from your administrator. Search there for your email. If you are not using Exchange or Office 365, the situation is different. The worst case is that you are using POP3 and deleting emails from the server as you download them. In this case your emails are in a file usually called outlook.pst (or something.pst). If Outlook opens, you can search the mailbox as you would for an Exchange account. No success? See if your email provider has a webmail option. This is likely today. Even if you do not know about it, your email may still be safe on the email provider's system. We've reached the end of the easy solutions. Hopefully you have now found your lost email; if not you may need expert help, or to manage without the lost email.